Life as a student can be exhausting; homework and studying are enough to keep even the best students up all hours of the night. But the KSA has your back. They’ve got Jitterbeans. The chocolate-coated espresso beans are now available, by the handful for just a dollar, in vending machines on campus. Jitterbeans, made by Osmanium Candy Company, are usually sold in either 40 gram or 17 gram boxes but the KSA wants to make sure Jitterbeans are popular at Kwantlen before selling them on a large scale. “Right now, it’s just the vending machines but if people like them and everything is okay we might look at other areas,” said KSA marketing coordinator Nathan Griffiths. There could be a problem with large-scale selling of the beans though. 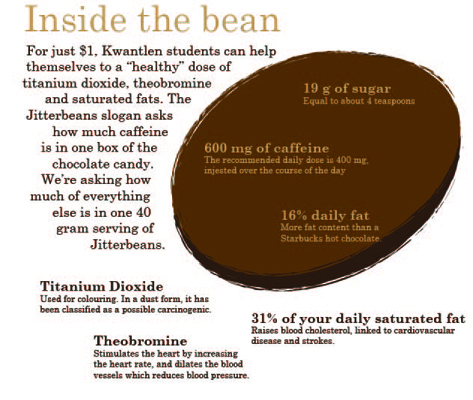 Each 40 gram box of Jitterbeans contains roughly 600 mg of caffeine. “That’s a lot of caffeine. Normally we wouldn’t stock a product like this for that reason but Jitterbeans has been so open and honest about the sheer quantity of caffeine that we thought that students were well informed… and could make the best decisions for themselves,” said Griffiths. The Jitterbeans posters hanging on bulletin boards throughout the campus say the 600 mg of caffeine per box is equal to six cups of coffee or seven and a half cans of Redbull. They also have a disclaimer at the bottom warning students against eating more than one box per day. Registered dietitian Natalie Brown echoed the Jitterbeans warning saying that even one box is probably too much. She said Health Canada recommends no more than 400 mg of caffeine per day and that it should be spread out over the course of the day. 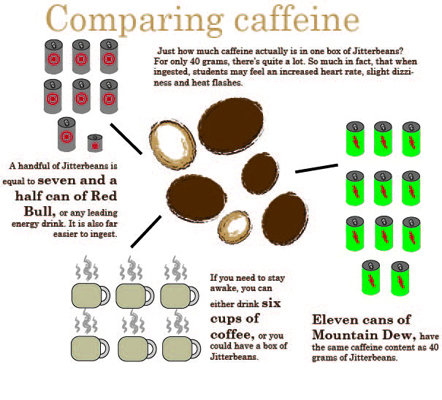 “When we have a lot of caffeine at once, it can cause a lot of different things. The acute symptoms are it can cause nausea, vomiting, heart complications, gastro-intestinal upset and then, as well, when you consume a huge amount like that, 600 mg, all at one time, it’s really hard on your system. You could potentially cause yourself to have a heart arrhythmia. [People] actually could have heart attacks from having too much caffeine at one time so it’s very dangerous,” said Brown. She also said that mixing Jitterbeans with alcohol would be even more dangerous. The high level of caffeine would make a person feel less drunk. She said that could lead to excessive drinking, and possible alcohol poisoning, or someone getting behind the wheel of a vehicle without realizing they are intoxicated.